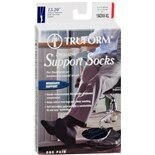 If you need compression and support for healthy circulation, browse various types of calf support socks. These support socks extend over the calf to offer graduated compression. 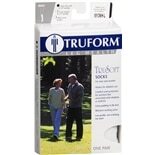 Look for calf support socks that can help you stay comfortable and healthy from brands such as Truform, Jobst or Futuro here at Walgreens.com. You can wear your calf support socks whenever you need them, since they come in different styles. For a professional outfit, you can choose black dress-style support socks in the level of compression you need. Athletic support socks typically come in white and can help you stay comfortable while exercising. You can wear your casual compression socks with just about any outfit. In addition to over-the-calf length support socks, we carry crew length and other knee-high stockings in varying levels of compression that can meet your needs. If you need graduated compression stockings for your legs, browse our selection of thigh-high and full-length support hosiery for men and women. For women, there are compression pantyhose that even come in maternity sizes that you can wear with skirts and dresses.